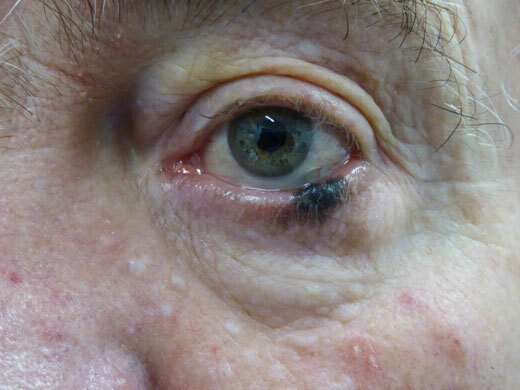 Cancers around the eyelids are common in patients referred to ophthalmologists. 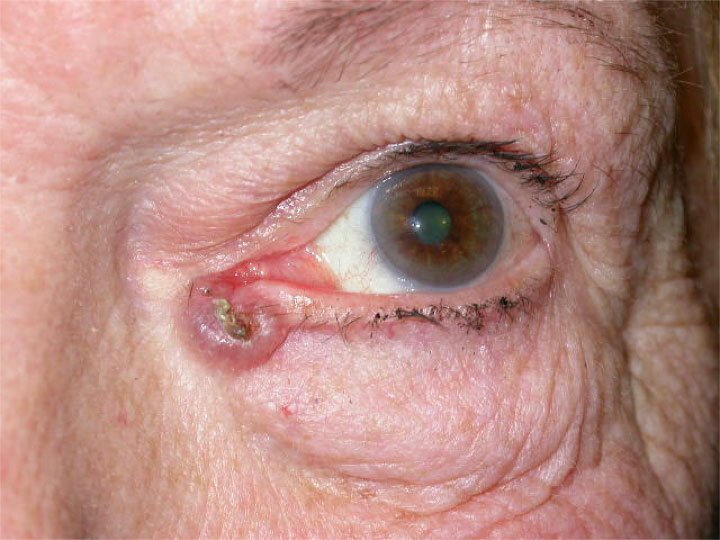 Skin cancers are often found on or around the eyelid skin, most usually on the lower eyelid. They can also be found on the margins of the eyelid, corners, eyebrows or rarely near the eye on the conjunctiva (the inner lining of the eyelid). They appear as lumps or elevations of the skin or as small swellings or nodules (see photo). 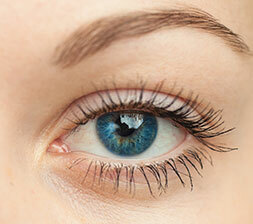 In some cases, eyelashes are distorted or missing. The cancerous area may be ulcerated, may bleed or crust and the skin shape may be distorted. These cancers are painless. Diagnosis may need to be confirmed by taking a sample of skin (a biopsy). Skin cancers are normally caused by excessive exposure to UV light – the sun or sun beds. The face, eyelids and arms are the main areas to be affected and fair-skinned people are much more likely to develop skin cancer than those with darker skin. Rarely, skin cancer can be an inherited condition. Basal cell carcinoma (BCC) is the most common form of UK skin cancer, also known as rodent ulcer. Early signs can include small lumps, scar-like or eczema-like changes on the skin. You may also see a small sore with raised borders. The second most common type is squamous cell carcinoma (SCC). The first sign of this can be a patch of scaly eczema. 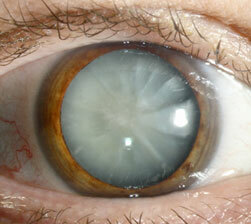 It is generally located near an orifice, such as the eye, mouth or ear. BCCs are slow-growing but can invade neighbouring parts of the body. They do not spread (metastasise) into non-adjacent areas. When detected early, there is a good chance of removing the tumour completely and minimising the amount of tissue that needs to be removed. Sebaceous gland carcinoma is a cancer of the glands that produce our natural skin oils and in 75 per cent of cases affects the glands around the eye. Causes vary and include triggers ranging from benign lumps to exposure to radiation and, rarely, a genetic condition called Muir Torre’ syndrome. Malignant melanoma is cancer of the melanin-forming cells that give you a tan. The more moles you have on your skin, the higher the risk of developing a melanoma. This usually looks like a large mole, which becomes itchy and painful, grows or becomes irregular. It may get darker, become mottled or bleed for no apparent reason. Again, excessive UV exposure is the major cause of melanoma. Fairer-skinned people are more likely to develop it and there may be a genetic link in some cases. These are more serious forms of skin cancer because they may metastasise to other parts of the body. They need prompt, aggressive treatment because of the threat of early spreading. To prevent a recurrence, the tumour should be removed completely, while as much healthy tissue as possible is preserved. Removal may be followed by reconstructive surgery, which could involve a skin graft. The general approach to removing skin cancer is known as margin-controlled excision, where the edge of the cancer is identified and the growth within this area is removed. It normally takes place under a local anaesthetic. Frozen section – cancerous skin is removed, frozen, sliced thinly and examined under a microscope by a pathologist before the wound is closed to make sure that all the cancerous cells have been removed. The aim is to find a clear margin — the edge of an area to which the cancer has not spread. If a clear margin is found, the wound is then reconstructed. 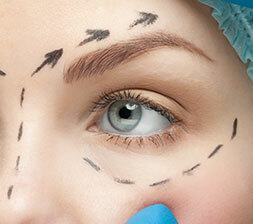 If a clear margin is not seen, the surgeon removes more tissue until the entire area has a clear margin. Paraffin section — this is similar to frozen section but the pieces are fixed in paraffin gel and dyed and then examined. This provides greater clarity but is much slower to process. In most cases, low definition images are perfectly adequate. Your surgery will generally take place under local anaesthesia, as a day surgery case. Examination of frozen skin slices can take up to an hour. You will be sent to a waiting room, so bring a book. Preparation of slices in paraffin can take a few days, so you will be sent home and asked to return. Occasionally, skin cancer wounds will heal on their own. This is known as granulation, or “Laissez-faire”. After surgery, you will have a pad on your eye overnight. If a skin graft has been used in reconstruction, you may need to wear a pad for up to a week. In some cases, the eyelid will remain closed for up to three weeks. If you have concerns about this, such as poor sight in your other eye, talk to Mr Kamalarajah. The healing process can take between six months and a year. Once healing is complete, you will need a follow-up consultation with your doctor to make sure that the cancer has not recurred. This ensures that any recurrent problem is detected and treated early.